Every 3 months I send an update. In my 4th I focus on listing some links for resources and events, before a few thoughts on “cutting love.” You can sign up to receive this Quarterly Bulletin. First up, the culmination of a year’s efforts, today the UN publishes a paper I co-wrote on how E nterprise Zones can contribute to the new Global Goals for sustainable development. These zones are popular with some governments, from India to the UK, but they aren’t without criticism, in terms of what they achieve. Now with changes in trade rules, Zones are going to have to come up with new ways of staying competitive. We argue that embracing social and environmental excellence is a clever response. I explained this in my article for the World Economic Forum. I was pleased to present the preliminary findings at the public forum of the World Trade Organisation (WTO) in Geneva in October, and the report is launched this week in Nairobi at the ministerial. You can read it here (pdf). I’m grateful to Dr Tony Miller at UNCTAD and also for colleagues at the University of Cumbria for supporting me to do this work. In September I stepped back from Director of the Institute for Leadership and Sustainability (IFLAS) so I can focus on my research and teaching as a Professor of Sustainability Leadership (as part time) as well as new role with an impact investing fund. I’m pleased Dr Caroline Rouncefield is the Acting Director and joins an Institute with 5 MBAs growing well (over 2000 international students), as well as co-delivery of an MSc in Strategic Policing and a new MA in Sustainable Leadership Development. One of the last projects I worked on was to initiate a partnership with the National Trust, to promote innovation in the heritage and conservation sectors, which was recently launched with some fanfare. Our Deputy Director Dr David Murphy will lead on the project for IFLAS. Trimantium Capital are the Impact Investors that I’ve joined the board of. Headquartered in Melbourne, Australia, it is making waves for attracting hundreds of millions of dollars into a fund directed at financial services and health technology with a clear social and environmental purpose. As the Paris climate summit started, I shared what some of us impact investors are thinking about the future of fossil fuels, in a WEF article. Some of the ideas behind the MA are contained in a co-authored paper just published by the Journal of Corporate Citizenship (JCC). I’m grateful to Richard Little at Impact International for having schooled me in critical leadership thinking these past 3 years. I also presented the paper at the International Leadership Association in October and will share some similar ideas at the ‘Lead in Asia’ conference in Bali on the 21st January. The 2nd cohort of our Mass Open Online Course (MOOC) on Money and Society went well, with around 100 people completing all 4 assignments over the month. That means they can now progress to the Certificate of Achievement in Sustainable Exchange, with the 5 day residential happening in our London Docklands Campus in April (as part of that spring school I mentioned). This labour-of-love for me and course co-tutor Matthew Slater, this free course is “bloody brilliant” and “mind bending”. The next cohort starts on Feb 14th and runs for a month online. Read more and sign up here. Since my last update I was pleased to receive an award for my past work on cross-sector collaboration for sustainable development. The award made the local news, and my paper on the future of such partnerships (think disruption and revolution) is available here. That’s nothing compared to being made an honorary fellow of the University of Cumbria. 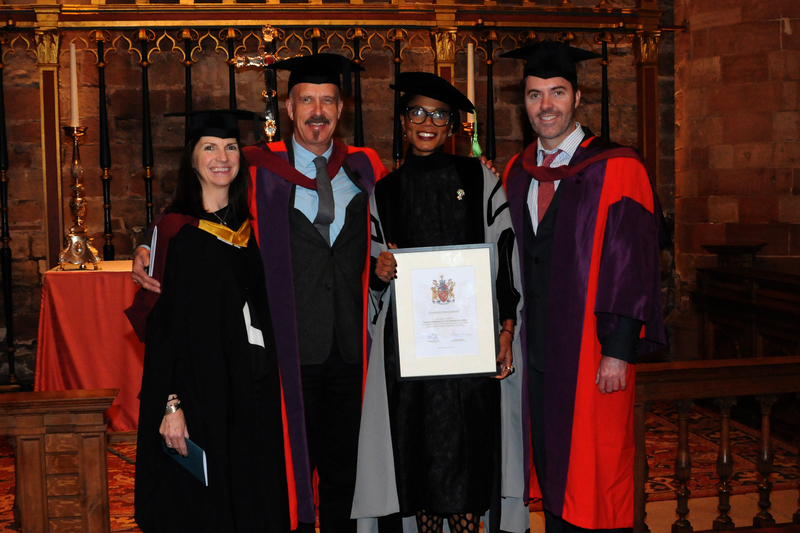 In November, my friend Funmi Iyanda became the first African Woman to be recognised in this way by the University and gave a powerful speech in Carlisle Cathedral. Her talk really reflected our ‘transmodern’ times, where we purposefully and playfully mix old and new ideas from all corners of the world to discover ways of rethinking progress today. Read her super speech here on the IFLAS blog, which is now also home to a regular series of articles on leadership themes. In October I was pleased to host Professor James Wilsdon’s at our Lancaster Campus to discuss the future of how we are going to be assessed as academics. James is the chair of the Campaign for Social Science. As the University sector has been blasted by austerity measures over the past years and will continue be, James does important work reminding everyone why it’s good that we do what we do and how to do it better. Britain has an incredible heritage of intellectual leadership of international importance, based on the country’s love of learning and its institutions of research and education. Sadly we have now become the most expensive place in the world to get a degree, while many Universities cash in on their heritage in the form of sponsored buildings and uninspiring pack-em-in courses. Unfortunately just the week after the celebrations in the Cathedral, a large part of Carlisle went underwater due to a storm that damaged many towns, villages and roads in Cumbria. The increased frequency and intensity of extremes of weather is in line with predictions from climate models. The events in Cumbria made climate change that much more personal, as explained in a first hand account by IFLAS Advisory Board member Becky Willis. The beginning of climate chaos is already upon us, with weird weather fuelled by a raised global ambient temperature of 0.8 degrees Celsius over the past century, along with seas warmer by 0.7 agrees and higher by 8 cm, on worldwide averages. The most concerning thing is the extremes, with the north-pole being about 5 degrees warmer than hundred years ago. After the floods people have begun to ask why the investment in flood defences and watershed management wasn’t increased in line with the known growing threat from a disturbed climate. The answer, again, is austerity. The floods are a reminder that you can’t ignore nature because of your politics. Looking across the country, the cuts in government spending can be seen as cuts in a nation’s commitment to its shared assets. Whether it is flood defences, education or care for the disabled, all the things being cut are the things that reflect a country’s capacity to love itself: to care for its towns, its people, its culture and its future. When a government is cutting back on love, people must fill the void, as has been the case in Cumbria, with a wonderful community spirit emerging. If you want to help support people who have been flooded, please see the Cumbria Foundation or Spirit of Cumbria. Although an agreement in Paris is important, the key is implementation. To make changes quickly, finance and trade ministers will need to shift incentives, hence the reason for my WEF blog. Ultimately we will need to redesign of our monetary systems, to allow us to thrive without requiring exponential economic growth, as I explain in the free intro to my last book. A COP21 climate agreement is a piece of the puzzle; but the puzzle is already burning. We will have to live with the weather that’s coming and that calls for us to go deeper in our discussions and planning, as I described for Open Democracy earlier this year. You can sign up to receive this Quarterly Bulletin.